While in Dubrovnik it is hard to pass up the chance to relax by the beautiful turquoise water of the Adriatic Sea. 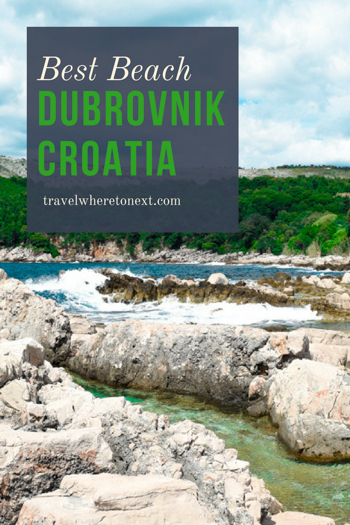 Luckily, Dubrovnik has a beach within easy walking distance from the walled city. Banje Beach is the most popular beach in Dubrovnik and for good reason, it is quite spectacular! Not only is Banje Beach the closest beach to Dubrovnik's old city it is incredibly beautiful with crystal clear turquoise water. To reach Banje beach exit the walled City of Dubrovnik through the east gate called Ploce Gate. After walking approximately 100 meters (300 feet) you will arrive at steps that lead to this lovely Dubrovnik beach. Of course you can relax in a beach chair or take a dip in the water but also consider renting a jet-ski! There are also pedal boats to rent and a number of charter boats that start at Banje Beach. Kayaks can be rented from the top of the stairs and Paragliding is popular as well on most days. Whatever you end up picking be sure to enjoy all that Banje Beach has to offer! Luckily, there is a restaurant perfectly placed beach side at Banje Beach. Simply called Banje Beach Restaurant, Lounge, & Club you can't miss it. Check out the menu here. It is an excellent choice for a couple of cocktails or a fancy dinner. You can read my full dinner review here.